There are three dead leaves hanging outside the window. I see them each time I sit at the table. They have been there for ten days. The one dangling from the top of the window twirls in the breeze. The two on the left side of the window are held firmly in place by cobwebs. From where I sit the cobwebs are invisible. Every day I think that I should maybe go out and brush them away. Every day I do not do it. I have become fond of how firmly they maintain these incidental positions. I heard gun shots up the hill and from the woods this morning, but there were never enough shots to make me think about what I was hearing. Later Siobhan and I went for a walk. On her way to meet me, she said she saw the Long Field being paced out by several men in camouflage clothing. Their guns were broken over their arms. The first of November is the start of bird shooting season. I forget it every year. It always comes as a surprise. Pheasants and partridges are the birds in danger. We were glad that we had decided to walk down by the Abbey and by the river. No men. No guns. It was a Mart Morning. 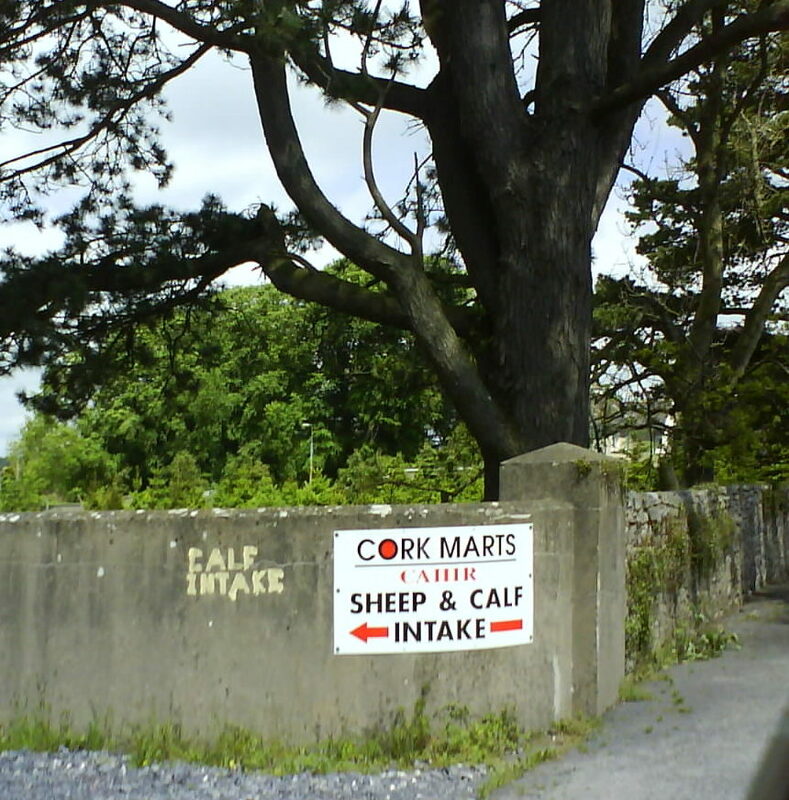 Every Wednesday is a Mart Morning in Cahir. Intake begins from 8.30 am. The farmers are all out with trailers full of animals. 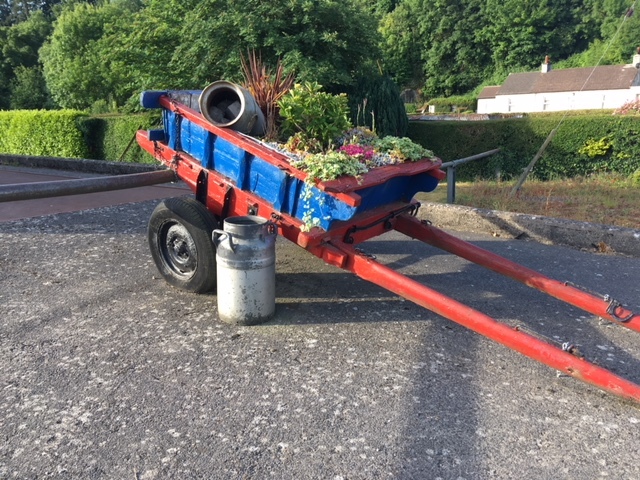 If we do not remember that it is Wednesday and if we do not remember that Wednesday is the day for the mart in Cahir we might be confused by the extra number of trailers being towed around and into the town. The approach roads are all a little slower than usual. Today it seemed like all of the trailers were full of sheep. Sheep are auctioned at 11. Cattle and calves are auctioned at 11.30. Some of the sales are from Farm to Farm. Other sales are from Farm to Factory. There used to be a hall with a kitchen and a canteen at the Mart. Joan Looby cooked a big hot dinner for all of the farmers who wanted to eat before they left for home. It was a big part of the day and almost everybody sat down to eat. It was the time for the farmers to chat. There was a fire a few years ago and the building burned down. Now there are no more cooked dinners. A decision was made not to rebuild the kitchen. There is a snack wagon that parks near the intake gate but most people ignore it. Snacks are not proper food. The farmers now go home for their dinner, with or without animals in their trailers. The flattened dog maintains his position and his watch on the road. This has been going on for months now. Sometimes I do not see him for four or five days. Then he is back again. He does not chase the car when it is going downhill. He only chases on the return trip when the car is going uphill. It is as if he knows that when I drive down to the village I will certainly be driving back up. He watches the motor and his head wiggles back and forth as I pass. His back and white sheep dog colours are crisp and bright against the sand and the drab grey tarmac. He lies a flat as he can. He thinks he is invisible. His chasing does not amount to much. It is all in the planning. Bank Holiday. It was frosty this morning. There was ice in the water butts. 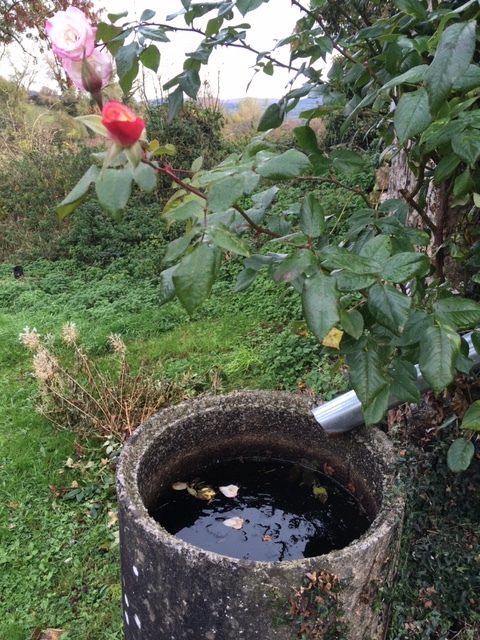 The water is frozen solid in the butts while roses are still blooming. It is much too early for such deep cold. The frozen water feels wrong. The roses are in the right. There is always another version of a stile. There is always another way to climb into a field which provides easy access for people but allows no escape for animals. TJ has a lovely new sign. I think of him as a blacksmith. 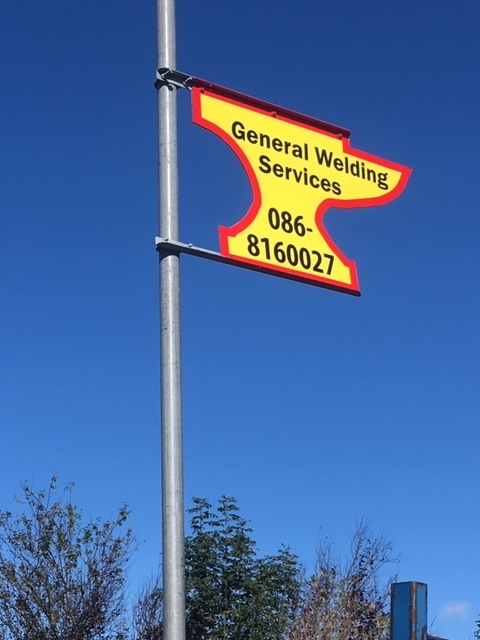 This sign offers his services as a welder. A welder with a bright attention-grabbing sign. 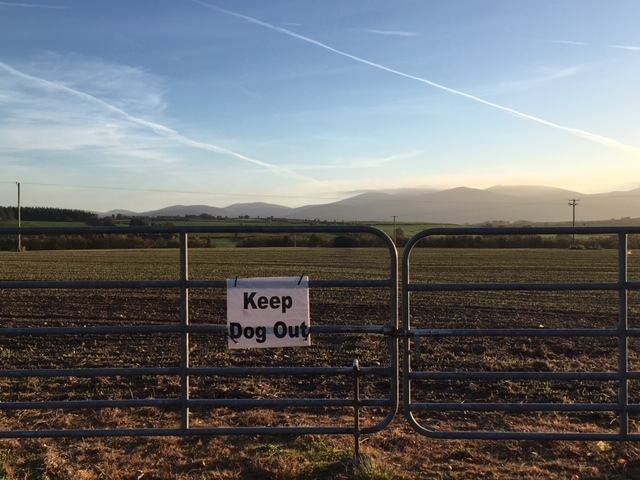 Once again I find myself pleased with this new bit of language in my landscape. We have a new postman. We have had several temporary postmen in recent years ever since John became ill. Once John retired, we had Lee. Lee has been the most constant of all the substitutes. We assumed that he was our permanent postman now. A few weeks ago he started driving down with Derek. He was showing Derek the route so that Derek could take over. Lee himself has been given a new route. We thought he was going to Kilsheelan but it turns out he is doing Marlfield. He had the choice of a town route with a bicycle or being out of town in a van. Derek said it was no contest. Lee took the van. Lee always arrived with the post very early. Usually he was here and gone by 7 or 7.30 in the morning. He had a speedy manner in all things. Talking. Walking. Driving. Delivering the post. Derek said that Lee was always in a rush because he always wanted to be back in town for his elderly Nana. She made him his dinner every day and he hated to disappoint her by being late. Derek does not come early. He arrives any time between 8.00 and 10.30. This lack of certainty makes driving out the boreen in the morning a little scary for us. It is terrible to meet anyone because if we do, one driver must back up for as far as it takes. We got spoiled by Lee and his early delivery. Derek ends every sentence with the word Girl. 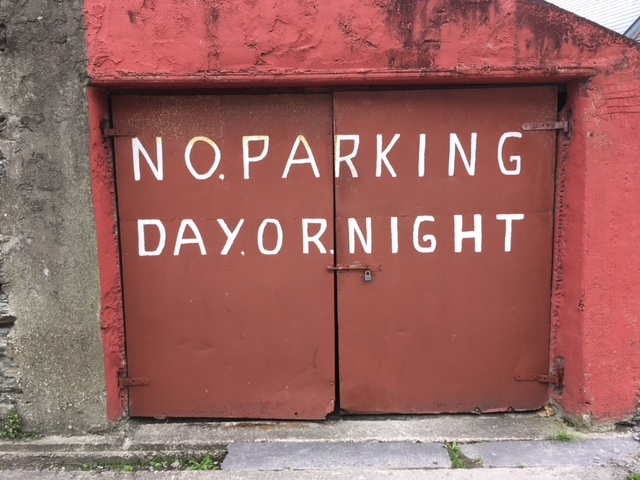 This is a very Clonmel way of speaking. It does not matter if the person being addressed is a man or a woman. The sentence still ends with the word Girl. I went into a small shop in town to buy some Pinhead Oatmeal. The woman at the counter told me that Pinhead Oatmeal is very old-fashioned. She was scornful that I was even asking for it. She told me that absolutely no one eats Pinhead Oats anymore. What they eat is Pinhead Buckwheat. She asked if I had ever eaten Buckwheat. I said, Yes I have eaten Buckwheat but what I want is Oatmeal. They are not at all the same thing. I told her that I was not interested in fashion when it came to breakfast. She herself is interested in being With The Fashion, so she no longer carries Pinhead Oatmeal in her shop. I purchased my oats elsewhere. A Church Gate Collection is a frequent event. 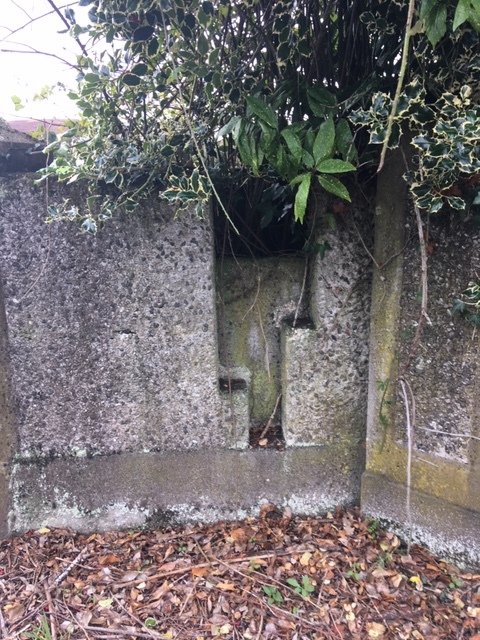 Ordinarily two people station themselves at both entrances to a church yard or they have one person standing on either side of the gate if there is just one entry gate. These people are collecting for some worthy event or charity. 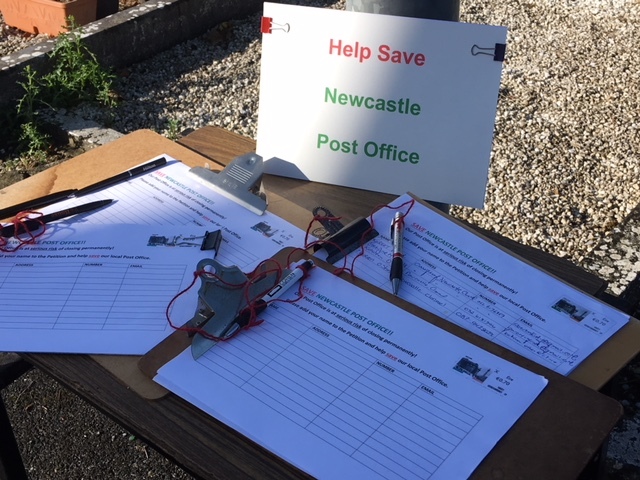 This morning I went alone to Grange church to collect signatures for the Newcastle Post Office petition. I was not collecting money but names. I had never done this before. I got there early to be ready. I arrived at 9.30 for the 10 o’clock mass. The first person to arrive was the priest. I introduced myself and explained to him that I had rung the office on Friday to get permission to be there. My committee insisted that it is was only right to ask permission from the priest. He asked what I was collecting for and when I explained, he waved his hand in the air and said he was fine with All That. The person in the parish office had told me that he is a temporary priest while the regular priest is on sabbatical. The priest did not sign my petition. It was silly for me to attempt this job by myself. Everyone arrived sort of at the same time but by two different gates. I was running back and forth trying to catch everyone. I had four clipboards. Each one had a pen attached to it with red garden twine. I had a little table with another pen and more pages. I had a small sign on the table. My sign kept blowing over as it was a breezy morning. One woman said she would think about it, but everyone else signed with alacrity, if not with much hope. Grange has not had a post office for several years already ever since the branch in Frank’s shop closed. Everyone feels the absence of both the post office and of Frank’s shop. I got a lot of signatures but I did not get every single person. Some headed straight for the side doors. Apparently everyone has a regular route into the church and a regular place where they sit every week. By the time everyone arrived and entered the church there was nothing left for me to do. There were no more people. Everyone who wanted to attend mass was inside the church. Everyone else was at home. I loaded my table and my clipboards into the car. From my arrival to my departure, it was all over in 40 minutes. It was lovely to wake up this morning after the heavy all night rain. The fields have that glowing almost florescent green colour that is nearly garish. It is a bright bright green that I never see anywhere else. We have not seen it for months and months. We have not seen it all summer. I am still dropping petitions in to various places. The conversations with each drop-off are animated. Today I attempted to leave some at the house of the hairdresser in Goatenbridge. She has no sign at her house but I was told that her name is Colette and that her house is the last one on the right before the duck pond. I could not find anyone at home nor anyone to ask so I went for a walk around the duck pond. It is a short circuit. Then I went off climbing the forestry paths for an hour and a half. On my return, there was still no one at the hairdresser’s house, if the house I had located was indeed the correct house. I went to the Glenview Lounge which is the only other business with a public face in Goatenbridge. The car park there has a glorious view over the valley and straight up the mountains and the glen. I could not believe how stunning it was. I could not believe I had never been there before. As soon as you enter the bar there is no view of the mountains. The outside does not exist when you are inside. There were two doors to enter. One door was labeled Lounge and the other door had no sign. I went into the Lounge. I was greeted by an older woman who was sitting at a table having a cup of tea from one of those shiny metal teapots. I explained my mission and she said that many people from Newcastle come over to Goatenbridge regularly to play cards. She said the villages have close connections. She called to a man behind the bar to take some petitions from me. He might have been her son. The bar was in the center so he could serve both the lounge and the other room from the one location. The woman said the post office in Newcastle was especially important since Goatenbridge has no post office itself. No post office. No shop. Just the bar. I wanted to tell them that Rose in the bar in Newcastle has been asking people to sign the petition before she will even serve them a drink. But I did not mention that. I just thanked them both and went back out to the amazing view. Walking in the same tracks and fields every day offers a restful quality. There is plenty to observe in small changes. There is plenty of time to think. 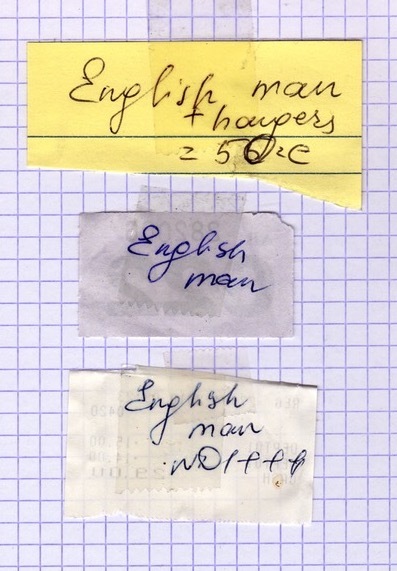 I find it a surprise and a delight to find language in the landscape. There is a sign in the ditch on the way home. It is a notice for planning permission. 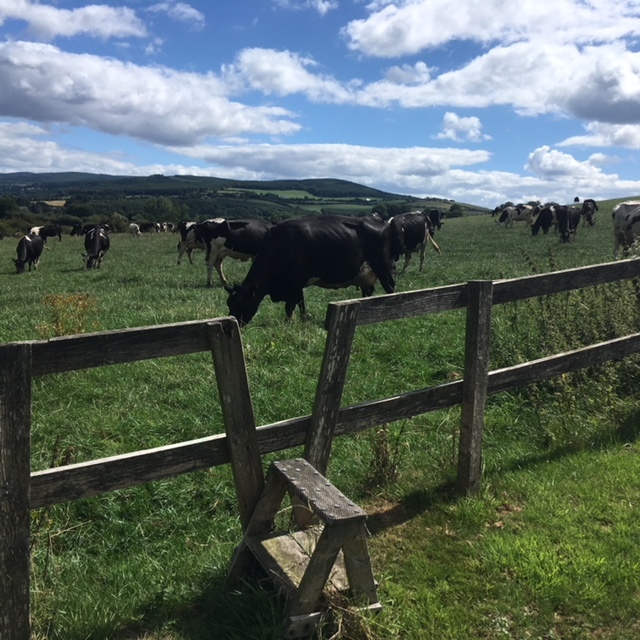 Joe is seeking permission to build an underpass for his cows so that they can cross the road by themselves when they have been milked and they are on the way back to their current grazing place. Most of Joe’s fields are on the other side of the road from where his barns and his milking set-up are. 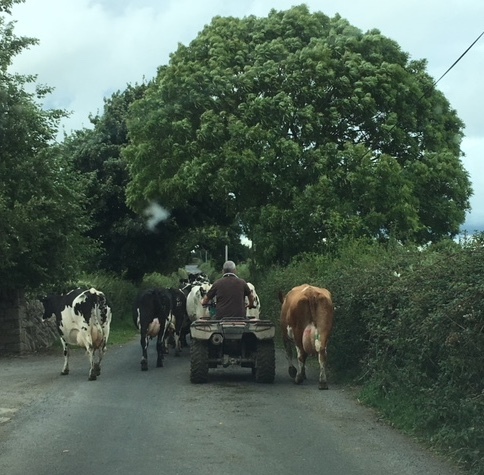 The cows can only go so far and then they have to wait for him to finish the milking and come out to get them and open the gates so that they can cross the road. This underpass system for the cows is new to me. 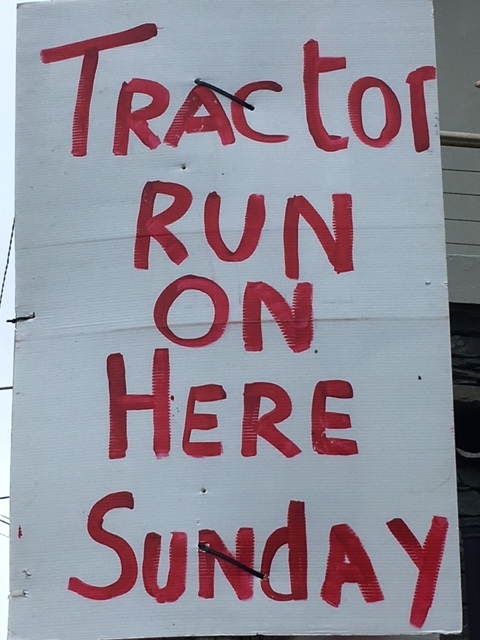 Apparently it is becoming very popular with farmers. 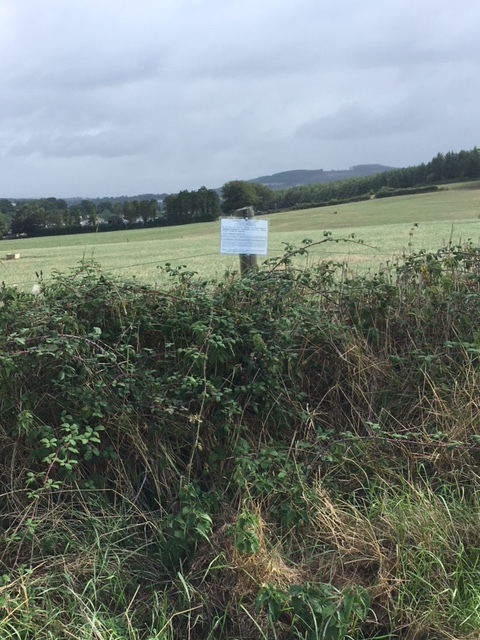 The little notice for planning permission was not only a little something to read in the landscape but it is a whole new concept. It is something to look forward to. Almost all of the fields around have new concrete watering troughs scattered about in them. 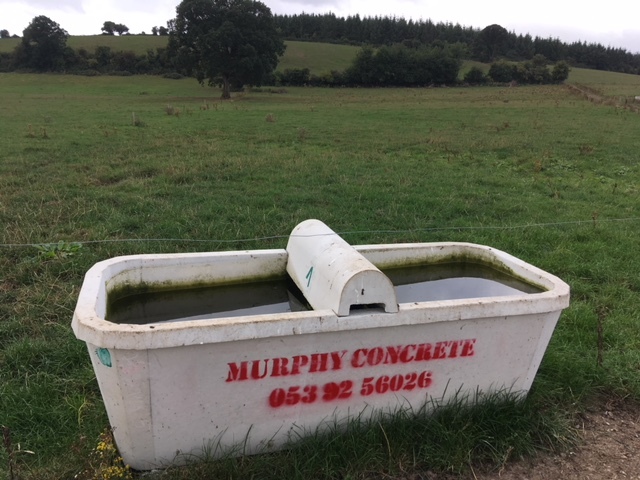 It looks like every farmer has these new troughs which are much heavier than the usual blue or black plastic ones of recent years. Maybe these last longer. Joe Keating is the only one whose new troughs have language on them. The name of the firm who makes and sells them and their phone number is spray stenciled on the side of each trough with red paint. 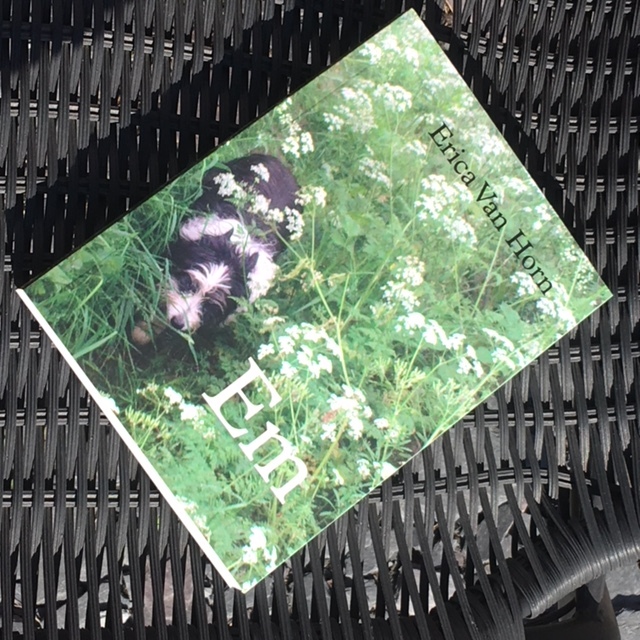 It is an exciting thing to see and to read in the middle of green pastures. 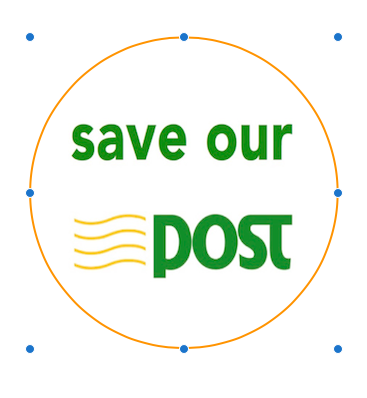 Every time I leave the Post Office petitions somewhere I get into conversations about the difficulties and possibilities and practicalities of saving our Post Office. Several times every day I am told yet another version of the man down in County Cork who runs a tiny post office in a tiny tiny village. Sometimes as the story is repeated, the man is 82 and sometimes he is 85. Once he was 87. He is determined to keep his post office open even though he is too old for the job. He would like to retire but he knows An Post will use his retirement as an excuse to close the post office. He is a national hero. Each time the story is retold, people feel more and more proud of this stubborn elderly Postmaster. The man working in the grounds of the church offered to show me around. He said he had just started to work for the church the week before. He was proud of the small church. He found it very special and beautiful. The church was a Church of Ireland which he reminded me was for Protestants. He said that he himself was a Catholic but he said the people in charge did not seem to mind about that since they gave him the job anyway. There are grain spills everywhere. 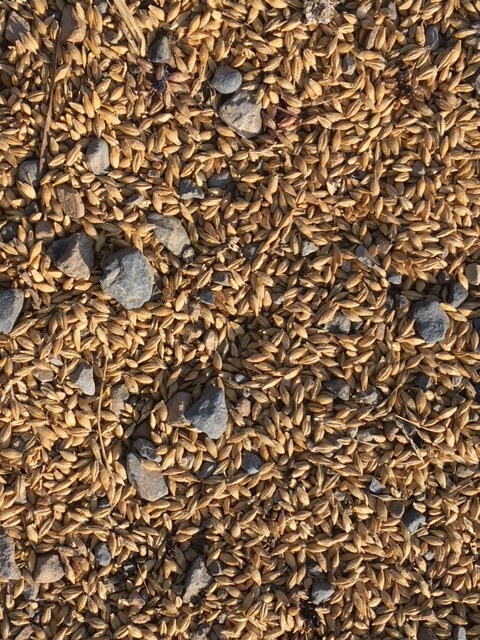 There are big grain spills and there are small grain spills. Tractors rush around trying to bring in as much of the harvest from this difficult dry season as they can. The roads are dangerous with the speed and the size of the machinery. The spilled grain always looks good in sunlight. I am a naturally parsimonious person. I do not like waste. When the toothpaste is getting difficult to squeeze out of the toothpaste tube, I cut the tube off with a pair of scissors. I cut close to the end with the screw top. I then scrape any remaining toothpaste into that end. I stand the cut-off tube on its top and I place a water glass over the whole thing. The glass keeps out any dust and insects. When we want some toothpaste we dip the bristles of the toothbrush into the remaining paste. There is usually at least a week’s worth of toothpaste for two people still in the tube. 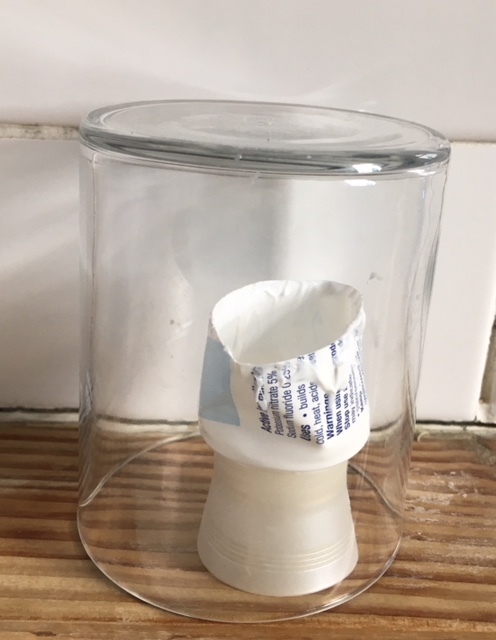 I like making this little apparatus for using up all of the toothpaste. I like using the dipping method. It is just as well that I did not mention that the glass over the top is also a way to ensure the slugs cannot get in. Last night I found a slug under the glass. It was not in the toothpaste but it was curled around the screw top. I am now in the position of having to reconsider this method. 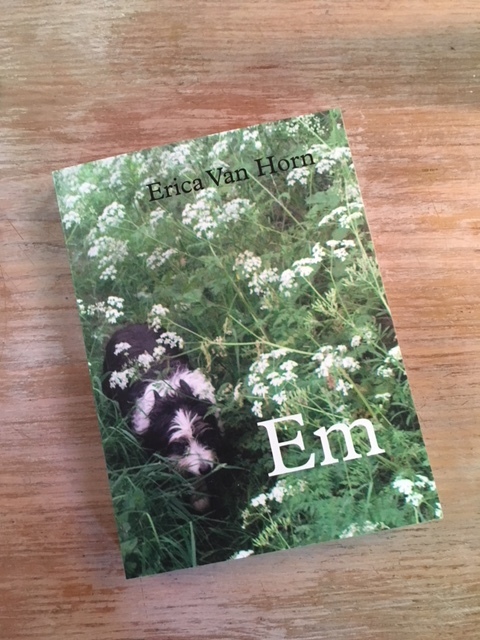 The Eircom man came down into the yard in a big white van. He stayed in the van and talked down to me out the window. He said he was out testing the poles. 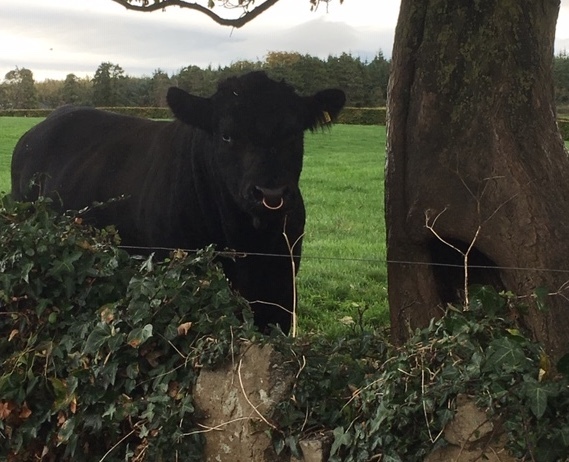 He was surprised to find us at the end of the boreen. He had no idea that there was a house down here and he had no idea there were so many more poles that would need to be tested. What he thought might be a morning job was now an all day job or maybe a two day job. While he was talking to me he saw a movement on the stone wall. His voice dropped to a whisper and he asked “What is that? Over there on the wall —What is it?” It was the mink rushing and leaping across the wall with its very fluid body movements. The man was not breathing. He was excited. He said he had never seen such a thing. I am wrong again. 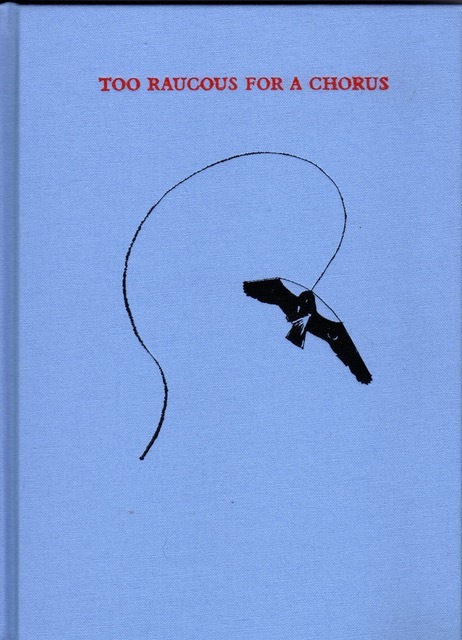 I was certain that the name Haulie was the nickname for a man who moved whatever people needed moved. He moved things like hay, silage, topsoil or stones with his tractor or his truck. I had no doubt that Haulie’s name came from his occupation. Peter has now informed me that Haulie is a nickname that comes from the Irish name Mícheál. The name is pronounced MEE-HAUL. MEE-HAUL to Haulie a logical development. It is still August but already the mornings are wet. The evenings are cool and the nights are cold so the mornings are wet with dew. Stepping outside to collect the breakfast raspberries is a different job than it was even a few days ago. Every morning I slip on my Wellington boots and go out with my bowl. Sometimes I take a cup of tea with me. Each time I reach in and underneath the leaves to take a berry my sleeve gets wet. Then the sleeve gets wetter. My dressing gown soaks up the water like a sponge. I could gather my breakfast fruit in the evening or afternoon. I could collect a bowl of both raspberries and blackberries and they would be dry and I would be dry and breakfast would be a different breakfast. The Post Office committee is silent. I had a long talk with John. He explained the path of closures: Tooraneena is to close. Ballymacarbery is to stay open. Newcastle is to close. Ardfinnan is to stay open. Clogheen is to close and Ballyporeen is to stay open. It is a straight but wiggly line. It continues throughout the entire country like this. There are 400 post offices slated for closure. If the postmistress or postmaster retires or dies there is an immediate death sentence for that Post Office. No one is allowed to take over a Post Office. No rescues are considered.The couple in Tooraneena who have been running both the post office and the pub out of their house are now 70 years old. They want to retire. No one in their family wants to take over the job anyway. The village is tiny. No post office in any of these villages means quite a drive for anyone who lives there to get their pension or dog license or to pay their bills or anything else. This is a huge problem for people who do not drive. There is little or no public transportation to accommodate this problem. I have always called the Keatings’ pasture the low meadow or the water meadow because it is the lowest piece of land in our immediate view. It has the stream running along one side of it. In very wet seasons the whole place is soggy because water runs downhill from both sides and it all settles there. Now I am told this is not called a water meadow. Nor is it a low meadow. This kind of field is called The Bottoms. The hedgerows are heavy blackberries. They are full of blackberries and full of honeysuckle. The blackberries do not seem to have slowed down with the lack of water this summer. Long tendrils of brambles reach out and grab at me when I walk or drive by. I spent an hour walking up one side of the boreen and down the other side. I clipped off the long thorny bushes which were the grabbing ones. In between clipping I ate a lot of berries. There are many different kinds. Someone told me that we have 30 different kinds of blackberry variations growing. I do not know if there really are that many but there are a lot. Most of them are plump and sweet. Every so often I eat a desperately sour one by mistake. I was happily picking and eating and clipping when I heard a terrible screech just on the other side of the ditch. One of the scruffy farm cats came bursting through the bushes and smashed into me. She was startled and I was startled. We both made squawking noises at the moment of impact. She took off at speed. I continued picking and eating and clipping my way towards home. An elderly couple came into the shop. The girl at the counter ran around the place and collected the things they needed. The woman announced each item one at a time. Both the man and the woman were badly bent over. They both leaned heavily on their sticks. The woman was the worst. Her head was bent down well into her chest and her back was bent over too. Without the help of her stick, she would be unable to stand. She would just fall over. It was difficult to hear her voice because she was sort of talking down into herself. She could not project her voice any better. She said something into her chest and then the man repeated it. He said, “Did you say you wanted The Milk, Mary?” And then he repeated that to the girl at the counter. He said, “Mary wants The Milk so.” The girl ran to collect it. It was taking a long time to get all of the things but the girl was willing and eager to help. She was cheerful the whole while. When they finished with the edible items, the man said that Mary wanted a mop. The girl asked Mary if she wanted the Hairy One or the Spongy One. The man repeated the question to Mary who gave her muffled answer. The man said that Mary wanted the Hairy One. I was ready to leave the shop but I had to wait to see what kind of mop the Hairy One was. It was the old-fashioned kind of mop made of long stringy pieces of white rope. It is the kind of mop that is very heavy when it is wet. It is difficult to squeeze out and it is hard work to use. The white rope turns to grey after the very first use. Hairy was the perfect way to describe it. Last night our Post Office committee met for the first time. 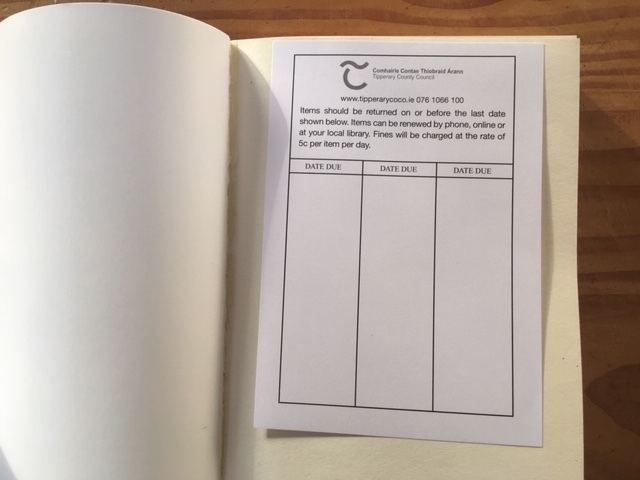 I rushed off to the meeting with a pad of yellow paper and three pens (one a green Sharpie for the colour of An Post) and an initial list of nine ideas for publicising the campaign. I had a plastic folder to carry all my things in. I was ready. Simon and I designed a badge and we researched where to get badges produced inexpensively. I had all the information. I could not wait to get going on turning this closure decision around. I came home completely depressed. I could barely speak. Apparently local attitude is very negative and the committee did not feel it worth while to go forward without a meeting with John. The post office is located inside the shop so apparently there is a feeling locally that the family are getting something out of the deal. There is resentment and distrust. 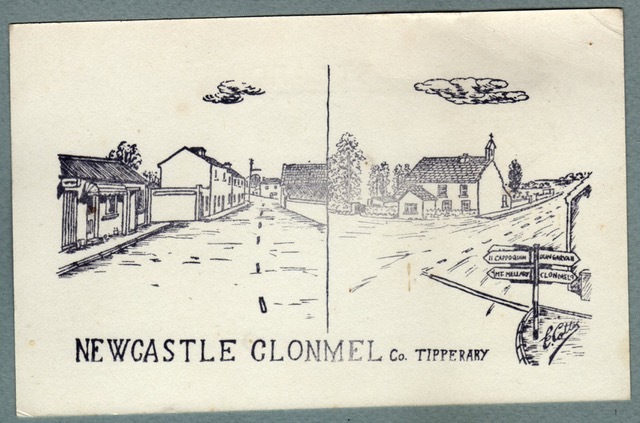 I have been told about the Irish problem of begrudging any good fortune of a neighbour. This is a really ugly example. I am stunned. It seems that few care about the Post Office. One committee member said that no one his age uses the post office. He could think of no reason to go to it ever. I wondered why he had volunteered to be on the committee. Suggestions to put things in the newspapers were met with the same kind of dismissal from him. No one who is young reads a newspaper. We know that we need to use social media in all of its forms but no one wants to start anything until we know where we stand with the local opinion. Our petition is printed up in multiple copies and ready to go. No one wants to distribute them nor go door to door with them until we have answers to the questions that we will be asked while asking for signatures. There is also the problem that if you write your name on a petition everyone else will see it and know that you have written your name on that petition. 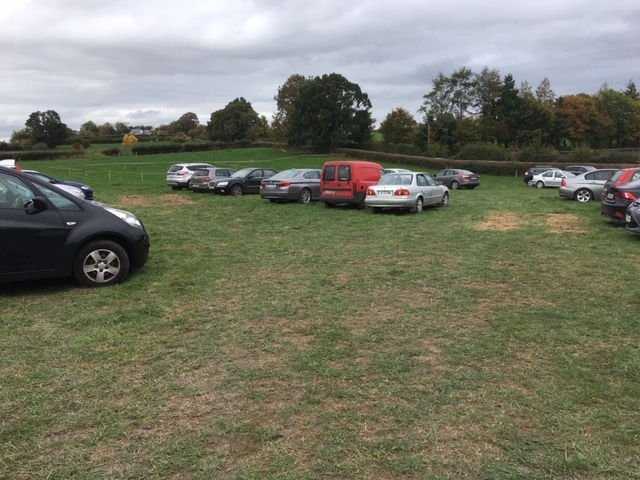 Ger told us that the 18 September, the day for the Big National Protest March in Dublin against all of the Post Office closings, is exactly when the National Ploughing Competitions will be taking place. Rural Ireland will all be at the Ploughing. They will not be in Dublin marching to save their Post Offices. I loaned Mairéad a pen to take a few notes. Everyone had their phones on the table in front of them. I was the only one with a pen. That was the least of the problems. I came home depressed. I went to bed depressed. I woke up depressed. I went to an emergency meeting in the village hall last night. 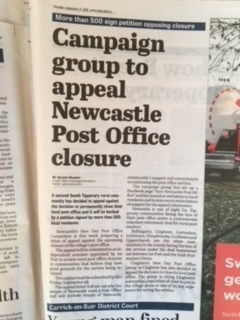 The meeting was called because the post office in Newcastle is threatened with closure. 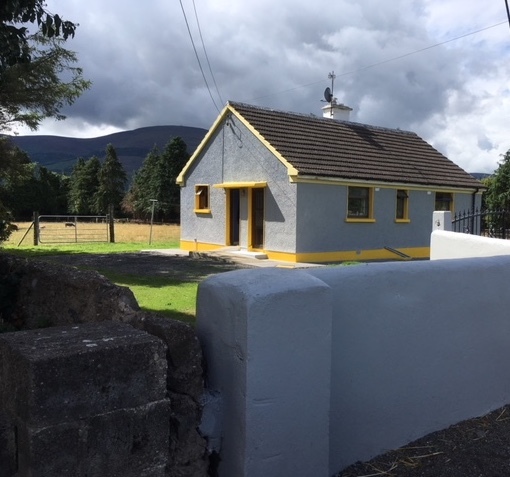 As is the post office in Clogheen. Hundreds of post offices in small places all over the country are closing down. 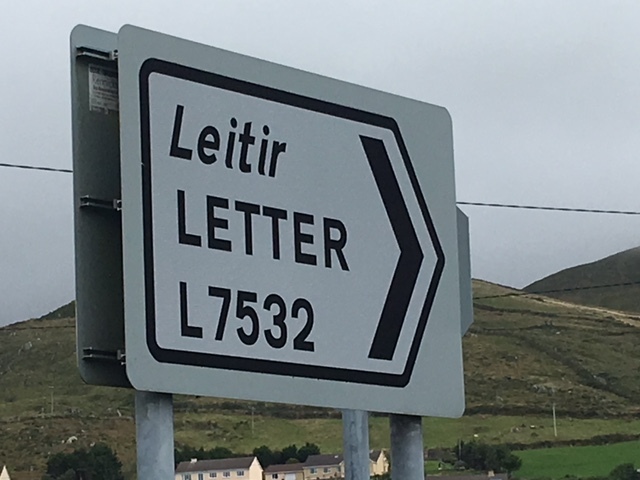 There are so many closure issues affecting rural villages, not only with the post offices though they are a huge part of life. . An older person going to the post office to collect their pension is bound to meet someone they know in the shop. They might buy milk or they might buy a paper while they are there. They might not buy anything. But they will have a conversation. They cannot go to the post office without having a conversation. And by the time that person gets home they will know the story of the whole town-land. Every one of us needs our post office for all kinds of reasons. We are going to fight this. I am now on the committee. I have stopped counting raspberries. It was a ridiculous thing to do anyway. It was easy to fall into when there were so few coming ripe. They are coming far too fast for counting now. Every morning I pick some and every evening I pick more. We eat loads. I put some in the freezer. I take them to neighbours. The figs too are ripening at a rapid rate. They are ripe and unctuous and without doubt the best figs we have ever grown. They are not at all woody. They went from rock hard to squishy and wonderful within a week. There are plenty for the birds and there are plenty for us. There is always another Tractor Run. It is a guaranteed way to earn money for a worthy cause. A long slow parade of tractors rolling through narrow lanes is a reliable draw. There are always some men happy to bring out their vintage machinery to show it off and give it a trip out in the air. 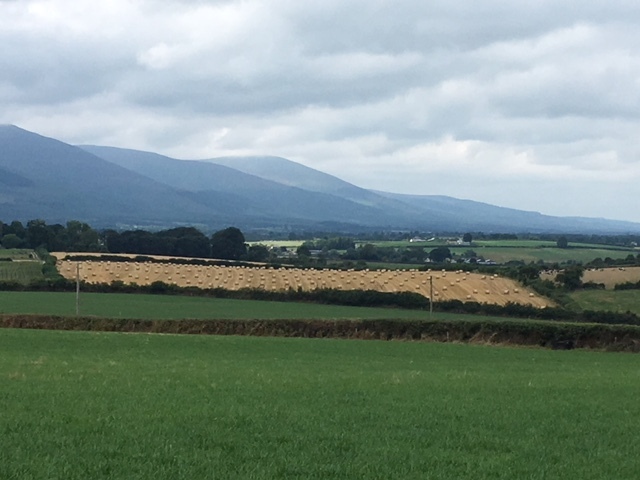 It does seem an odd time of year for a Tractor Run as the farm workers are all so busy with haying and silage. The roads are already full of slow moving vehicles and machinery. The slow ones are not a problem. It is the speeding ones that are frightening. 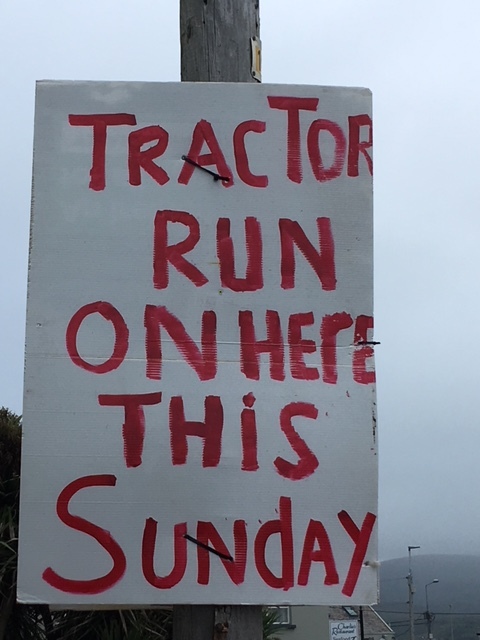 This Tractor Run is advertised to benefit a man called Haulie Murphy. I do not know Haulie Murphy, but I like his name. I like names that tell you what job a person does. Whoever Haulie Murphy is, he is obviously someone who moves a lot of things around with his tractor and trailer or with his truck. Larry Doocey could be nicknamed Haulie what with all the runs he does with his small tractor. He delivers gravel and topsoil or whatever else people need. But he is not called Haulie. He is always Larry Doocey. No nickname. For years we assumed that Christy Driver was the actual name of Christy Driver down at the bar and always occupying the exact same corner seat. But it was not. We missed a party celebrating his 60th birthday. We had been invited but because we did not realize that his real name was Christy Cullinan, we did not go. We did not know whose party we had been invited to and so it was easy to forget all about it. Christy Driver is always and only spoken of as Christy Driver. Today is the beginning of Heritage Week. There are activities and tours and free access to buildings and monuments all over the country. There seems to be a lot of storytelling. In Clonmel, they are combining Heritage Week with the 50 year anniversary of STAG. STAG is the South Tipperary Art Group. The idea they came up with for the day is to set up four age groups from young children to adults and a list of locations. Any amateur painter is invited to go out to one of the assigned locations to paint a picture. They are invited to create A Brand New Original Piece Of Art From Scratch In One Day between the hours of 8 am and 5.30. The paintings must be turned into the art centre by 5.30. Winners from each category will be announced next week. The fox came running around the corner of the shed. He was moving at speed. I was sitting on the bench with a cup of tea. He saw me at exactly the same moment that I saw him. He skidded in the dirt and gravel and changed direction while he skidded. There was hardly a wasted movement except maybe a little bit while his legs found their place on the ground. He was gone in seconds. I took a full load of stuff to the dump. As I was moving back and forth between the recycling bins and my car, a woman came over to me. She told me that I looked well. I thanked her. I wondered if I knew her. She said she never knew exactly how to dress for the dump. She said the gathering up of stuff to load into the motorcar was a certain kind of activity as was the unloading. It could get a little messy. If she chose to go into town for some messages after the dump-run she liked to look maybe a bit nicer than she would if she was only going to the dump. She did not like to waste a trip to the dump without going to town too. What with the price of petrol and everything. She liked to look carefully to see what other women were wearing at the dump to help her to decide exactly how to find the balance. 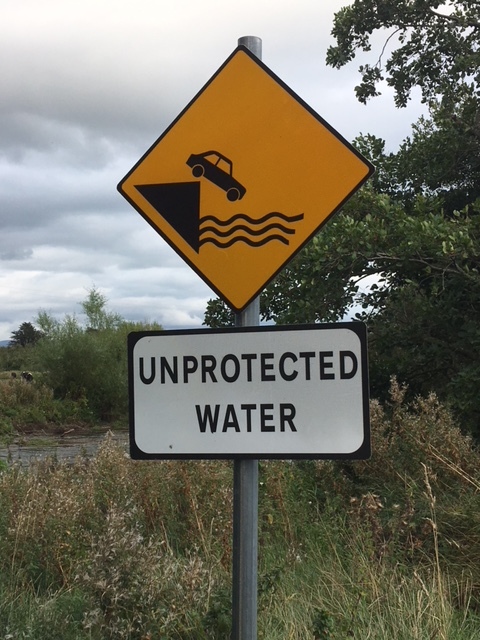 The drive back from Kerry was scary. A soft drizzle had come down. It became a fog. It was impossible to see a thing. The road was winding and narrow with steep drop-offs into the sea. There were a few tour buses crawling along full of passengers who could not see a single bit of the Ring of Kerry which is what they had come for. The drive was slow and the drive was difficult. We reached Kenmare where we planned to have a good lunch to reward ourselves for the terrifying journey. Cars were parked all along the road entering the town. A cattle market was in full swing right in the centre. There were trailers and tractors and cows and bulls and farmers everywhere. There were a lot of tweed jackets and caps and there were a lot of rain jackets. Some sections of the streets were completely closed off. They had been transformed into big holding pens for the cattle. There were deviations added on to deviations. It was not possible to stop the car. There was no where to park anyway. Hundreds of people plus all the animals and everything under a steady downpour. We escaped as best we could which was slow. We ended up in Kanturk which is a good name but the lunch we found was dreary. There was a man on the corner near the restaurant with a small blue car. Four young children were squeezed into the back of the car. The children were tight in and screaming and making a lot of noise. They might have been happy or they might have been miserable. It was hard to tell. A woman stood quietly near the man. He had three bunches of Dirty Carrots on the bonnet of the car. He was a huge and loud man. He kept banging the bonnet and shouting that he only had three bunches of his delicious Dirty Carrots left. He shouted that when he sold these last ones he would be able to go home and eat The Dinner. Each time he banged the bonnet more muddy soil fell off the carrots. There was no one about. It was not a busy location. I did not buy any of the carrots. I would have liked to have made a photograph of the man and his family and the carrots but I knew that if I took a photo I would be expressing more interest than I had. The man would certainly have pushed me to buy his carrots. It would have been difficult to refuse. I have marveled before about this love for Dirty Carrots. Somehow the heavy clumps of soil coated on the carrots hold great promise. The promise is that they will taste better than another carrot which is just carrying a thin easily washable amount of soil. I have never found this to be so. I find cleaning the Dirty Carrots much more work than they are worth. The sink is always full of mud and stones after the washing. A normal unwashed carrot is fine. A Dirty Carrot is not. When we left the restaurant, the car and the man and the family were gone so I assume somebody else came along and bought the remaining Dirty Carrots. There is much talk of Fodder Shortage. The things that cattle are eating now are the things that they should be eating in the winter. What will they be eating in the winter? 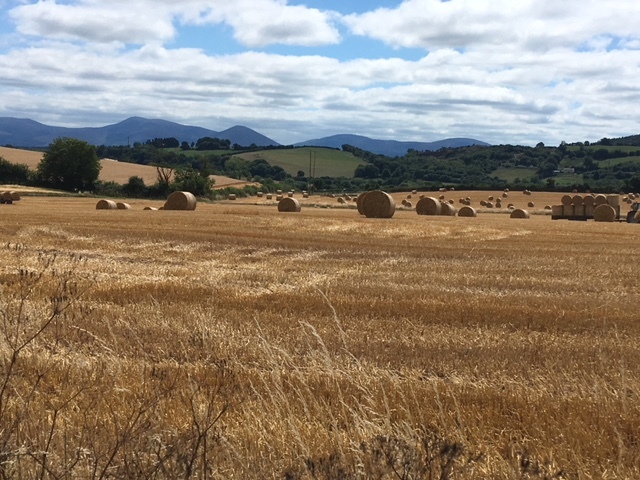 Some hay fields are being baled up. I do not think any of whatever is done is can be enough at this late stage. We are not finished hearing the term Fodder Shortage. I think I just like the word Fodder. 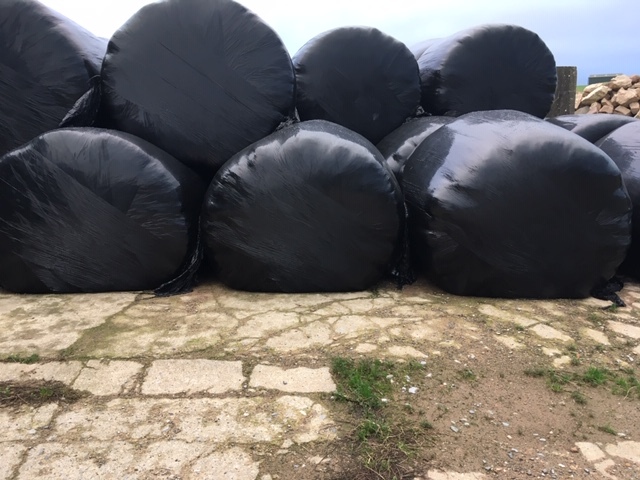 Silage Widow is another favorite seasonal expression. Tipp FM announced the winner of last nights lottery as someone from Waterford. Actually, they are not sure that the winner is from Waterford but they know where the winning ticket was sold. 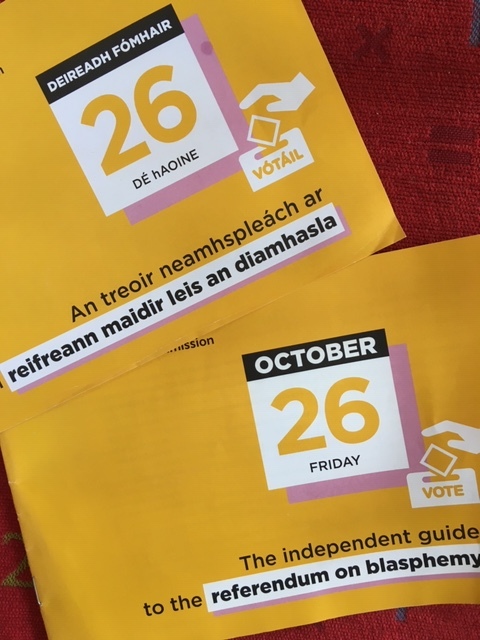 The ticket was sold from a shop in Waterford. This makes everyone happy. 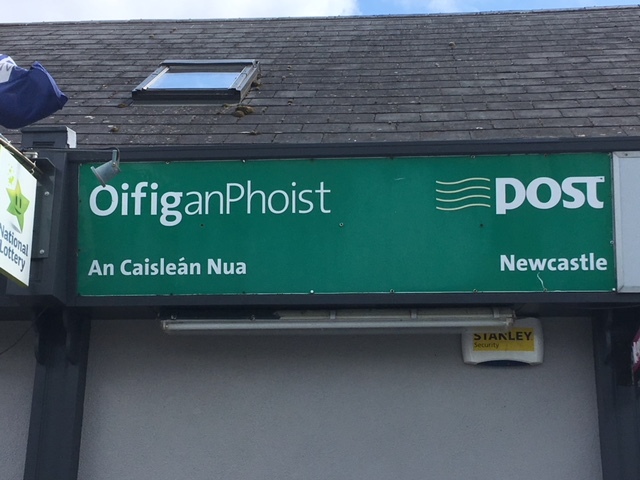 The radio announcer named the shop and said there was no doubt that having a winning ticket sold right there in that shop for a win of one million euro would provide a great cheering boost to the people of Waterford on this Bank Holiday Weekend. Replacing the roof was one thing. Clearing up after two years of leaks was another. 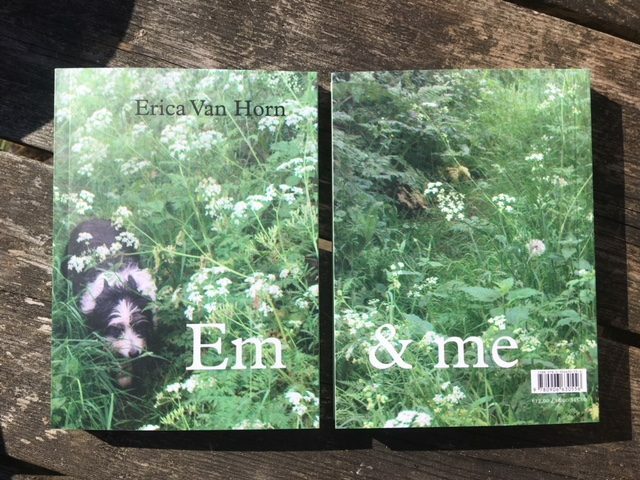 Every time a new place flowed with rainwater, we gathered things into boxes or piles and pushed them somewhere just to get them out of the way quickly. Every time a solution came along we assumed it was the final one and that the dripping walls would end. The leaks moved along the seam between the fold where the two roofs joined together. The bathroom leak was a constant and always in the exact same section of wall. Except for the one time when it took over the ceiling and then the water came in everywhere. The kitchen leaks were in several places and they moved back and forth.The most worrying leak was the one that made its way through the fuse box and continued straight down to the floor. The kitchen ceiling flooded too. Both ceilings have big stains which are yet to be fixed. One part of the ceiling was ripped open and closed up again. That place is a large raw plaster area waiting for paint. It has been easy to condition myself not to look up. 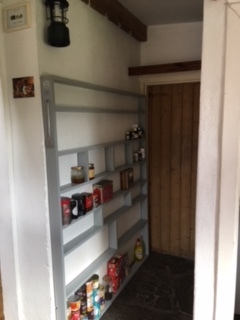 In the big room, the three meter long shelves above the cupboard and the six shelves inside the cupboard, also three meters long, will no longer be soaked in the next rain. We cleaned and oiled the shelves. We cleaned and coated the wall behind them with stain-covering paint. I was amazed at how black even the very bottom shelves were. Water damage is pervasive. The pans and plastic containers and newspapers and towels catching the rain water were never enough. After cleaning and painting, I began collecting the bags and boxes of stuff which had been spread around the house and down into the barn. Things just kept appearing. Books had been lined up on the floor and piled up on other parts of the floor. The trouble with it all was that the books had been rushed away from pouring water. They had not been examined. They had been moved in a state of panic and with great speed. Many cookbooks were completely destroyed. 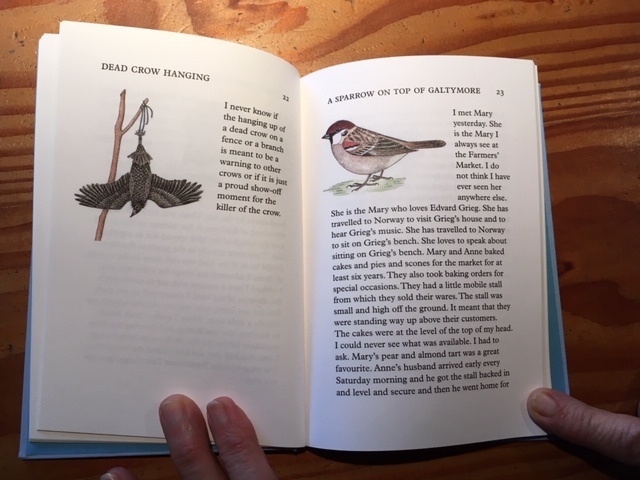 The pages were rippled with moisture and sometimes stuck together. Things had been moved and then they were moved again. There was no sorting. With this dry weather, I moved chairs and rugs out doors while I struggled to regain order. Flashlights which had been on the shelves inside the cupboard and then moved out of the way were useless. The batteries and innards were full of rust. Some were still wet inside. They are good for nothing. Several old dog collars belonging to Emily had been saved. Why I do not know. They are now mouldy, but how can I throw them away? A dog whistle on a white string that never worked anyway but that someone gave me when Em was first going deaf. It is not water damaged but should I throw it out or shall I just move it somewhere else? Bowls and cups full of silvery lichen gathered on various walks. The big bowl of lavender from last years garden, or maybe from two years ago. Innumerable stones from various beaches. Every single thing in the room and from the shelves and on the windowsills came under scrutiny. Pine cones. Everything is precious. But a clean-up is a clean-up. Everything that I look at in the entire room demands a decision. I am no longer restricting the purge to the shelves that got wet. Usefulness is not always the best way to decide things. 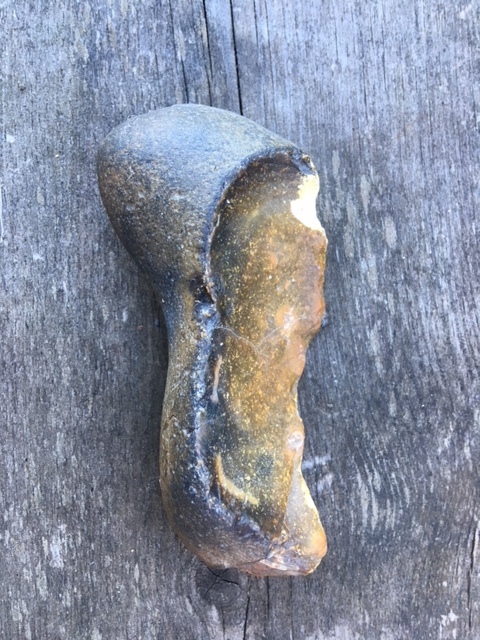 Do we need this stone which looks exactly like Prince Charles’ ear? It has taken all week to get to the end of this indoor work. The roof is finished. The out of doors is cleaned up. The indoors is now cleaned up too. There are now boxes full of stuff up in the barn. They are ready to take to sell at the Car Boot Sale in Fethard. I shall probably never get around to doing the Car Boot. Maybe Pat Looby wants them to sell at her weekly table. It seemed an auspicious way to begin the week. I trapped one of the enormous house spiders in the bathtub. It might have been a Cardinal Spider. Or just a Giant House Spider. I took it outside and a long way from the house. I am certain these spiders come back and crawling up the drain pipe and back in the tub. 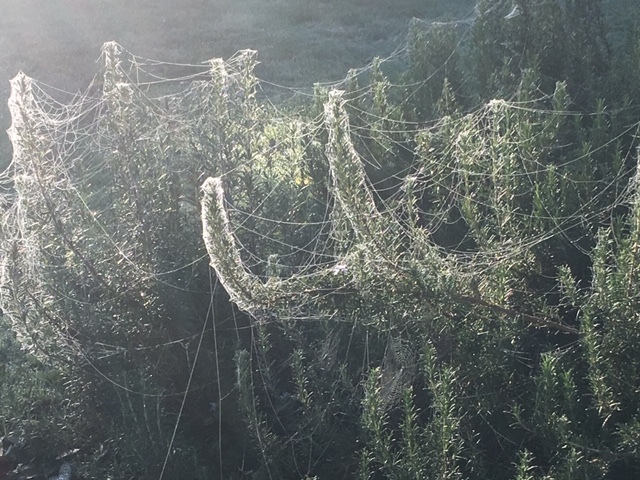 The spiders are everywhere especially at this time of year. The spiders make lots of cobwebs and the cobwebs get full of sticky dust and I feel the house is always in the process of being taken over. I never see so many spiders nor webs nor so much dust in other houses. I drive past three farms on the way to the village. Only one has the flattened sheep dog. He is at the last farm on the way down. He is at the first farm on the way back. 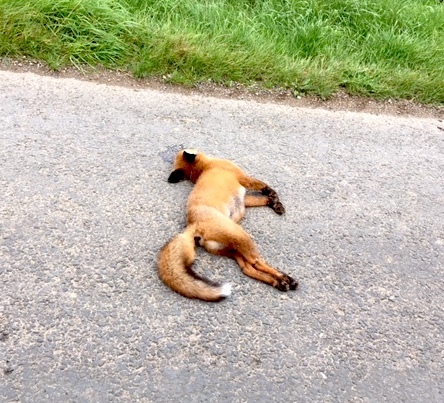 He lies on the road as flat as he can make himself. He sticks out quite far into the single lane road. He is black and white. He thinks he is making himself invisible but he is completely visible on the grey road. He waits until the car is almost beside him and then he rushes out as if he is going to bite the tyres. He never does more than a quick dash and then he gets back in ready position to await his next victim on wheels. He does not want to bite a tyre. He does not want to catch a motorcar. I always slow for him and his almost attack. It is a game we play together. There is so little traffic on the road he does much more anticipating than dashing. 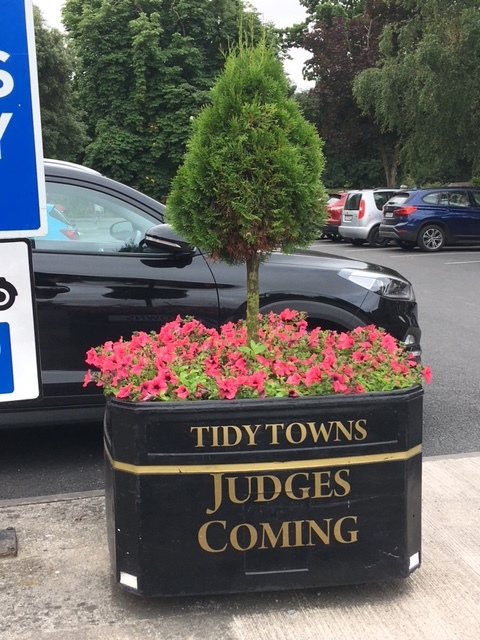 The yearly National Tidy Towns competition is underway. Some places get really busy with their floral displays and presentations. Some towns just ignore the whole thing. This year is proving tough for everyone because it is so hot. Everything is dry. Things like hanging baskets need a designated person with water standing beside them nearly all day long. 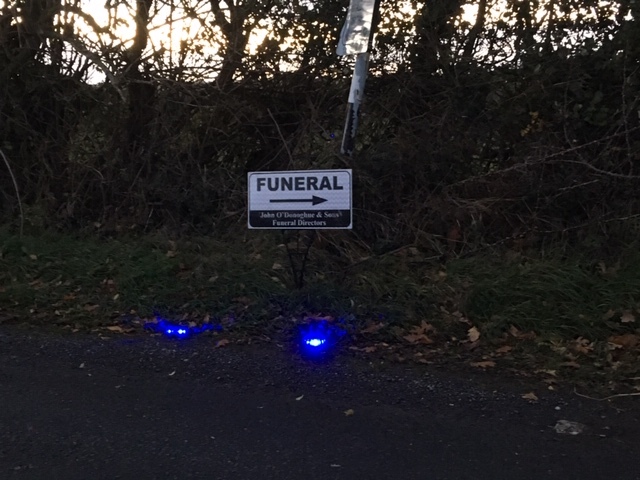 As a village, Ardfinnan always takes its place in the competition quite seriously. There is a painted boat at a jaunty angle full of flowers on the green. 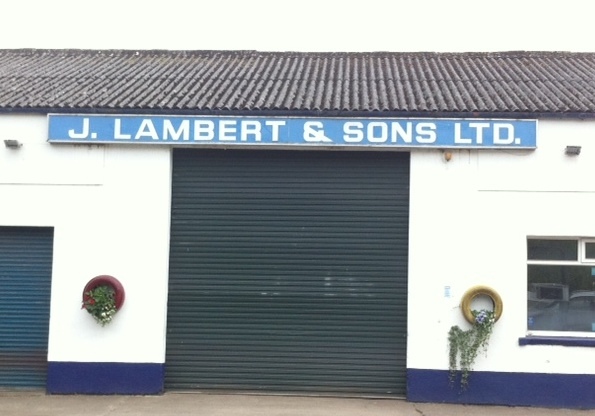 Lambert’s garage has their usual painted tyres mounted on the wall with flowers tumbling out of them. I am not sure if the painted cart is a new addition or just one I might have missed in recent years. In addition to the floral arrangements the cart has two milk churns, one inside with the foliage and one on the ground beside it. Both of the milk churns are chained to the cart and the one placed inside is full with a cement block and some rubble just to make sure that the display position stays fixed.